Not bad for a 40 year old eh? 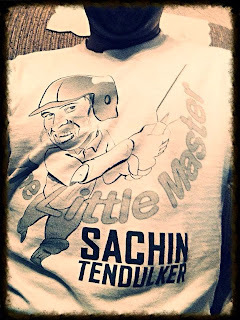 I know every blog piece I have ever written is on Arsenal but I just had to put a few thoughts on paper for the great Sachin Tendulkar. I first got into cricket on a trip to India in 1996 (I was 8 years old) – the cricket world cup was on at the time and a match between India and Pakistan meant India was a ghost town with everyone indoors watching their country play. I kept hearing the name Sachin Tendulkar and I was curious to know who this man the Indian public were speaking so highly of actually was. I started watching the world cup and it ended with Sri Lanka beating Australia in the final. I was hooked. I came back to England and took a keen interest in the game. Being a British born Indian, I was always keen to follow both, England and India but the name Sachin Tendulkar always made me think of the people in India and how much they adored him – Cricket was their religion and Sachin was like their God. I followed Sachin’s career from there and watched videos of his innings from his younger days – his first class century for Yorkshire was pretty special but his first ever test century at the age of 17 was just wonderful. You could see it then how special he was and how good he could be. Supporting Arsenal under Arsene Wenger always makes me analyse sportsman behaviour and Arsene would have loved Sachin; he conducted himself in what was seen as the correct way. He loved cricket and spent hours and hours practising to make his game perfect. Bad headlines and Sachin Tendulkar were never linked and he was loved and respected all over the world. Several of Sachin’s innings will always remain with me – the first is the way he took on the great Australian bowling line up in the Middle East to win the Sharjah Cup for India. He scored 134 from 131 deliveries and he was simply superb. Not many people have dominated Shane Warne like Sachin did that night. The second innings I remember very well was in 2008 against England. He scored a ton under pressure and won the game for his country. This was a special innings in particular not only because India were chasing 387 on a day five pitch but because of what happened in the days leading up to the test match. The city of Mumbai had suffered the heartache of a terrorist attack just days before this test match and to the credit of both teams, in particular England, both teams put on a fantastic test match. "By no means am I saying this will make everyone forget what happened in Mumbai but I'd like to thank England for coming back and playing Test cricket and we've witnessed a wonderful Test match - people are enjoying cricket the way it's meant to be. What happened in Mumbai was extremely unfortunate and I don't think by India winning or me scoring a hundred, people who have lost their loved ones will feel any better. It's a terrible loss for all of them and our hearts are with them, but whatever manner we can contribute to making them feel better we'll make that effort." Said Sachin. This was a 35 year old man who was born in Mumbai and was very proud of his country – his dream was to make people happy and during times of suffering, he was determined to at least try and put a small smile on the faces of everyone in Mumbai by scoring runs to win a game for India….and Sachin, you certainly did that. England captain Kevin Pietersen said: "Who can write Sachin Tendulkar's script any better? The man from Mumbai came in and scored a sensational hundred today. He batted like a superstar. We tried everything we could but unfortunately he just came good. The boy played well." The final time Sachin played in England, he made 91 on a day five pitch and the applause he got when he walked back into the pavilion is something I will never forget. I was sitting straight down the ground and as Sachin walked back, the entire ground got up and everyone there knew this was the final time they would see him step onto the field as a player in England. He is a special man who has had the pressure of a nation on him – a nation that always expects to win. I saw it for myself in 1996 and again when I visited in 2004. Sachin Tendulkar stayed at the top level for 24 years and did it with such grace and humanity. People ask the question whether Sachin or Lara was the better batsman but that’s like asking about Messi or Ronaldo or Pele or Maradona. Some questions just do not need answering - Lara and Tendulkar were both world class players and I am glad I got to see both play many times. Sachin deserves all the credit he is getting and all the praise is justified because he was that good. One hundred hundreds, most runs in test cricket, most runs in one day international cricket and a world cup are just some awards that belong to Sachin. There will never be a player like him.